Safe Rental Car Act: What Now? These recall notices were mailed to International Franchise Systems, owners of the Nextcar, Priceless, and Rent-A-Wreck brands. The company estimates that 80% of those notices are erroneous, mostly because the company no longer owns the cars. Some 900 auto recalls were issued last year, or 2.5 per day. In the last two years, more than 100 million vehicles were affected by safety recalls. To put this in perspective, 260 million vehicles are registered in the United States. While a smaller percentage of those recalls affect rental fleets, the sheer frequency of recalls issued and the volume of models affected demonstrate the fleet management and customer service issues all rental companies are facing. The obligations set forth in the law (see sidebar), while seemingly straightforward, raise immediate questions and pose both compliance and operational challenges ahead. We’ll answer what we can now and share some best practices on how to meet those challenges. From a fleet management standpoint, the most immediate compliance issue pertains to the law’s requirement that recalled vehicles in the company's possession be grounded 24 hours after the operator receives the safety recall notice. The law says that the clock starts after receipt of the written recall notice from the National Highway Traffic Safety Administration (NHTSA), either via U.S. mail or email, though electronic transmission is not yet part of the notification process. But in the real world, recall information is made public weeks — or even months — before the written safety recall notice arrives on a car rental operator’s desk. NHTSA posts recalls to its publicly available database concurrent to the auto manufacturers posting recalls to their publicly available databases. This is when the general media would run the recall as a news story, though not necessarily. Neither the Safe Rental Car Act nor other provisions of the transportation bill correct this timing issue. The lag time between the release to the media and the mailed notice currently poses some challenges that the law does not address: foremost, a potentially unsafe vehicle could be available for rent for months before an operator is under any legal obligation to do anything about it. Second, this timing difference could become a customer service issue if renters are aware they are driving a recalled vehicle before the operator does. And, if an accident occurs, the timing issue could lead to greater liability exposure under the legal theory that the operator had “constructive knowledge” of the recall but didn’t act. How is fleet size measured? The law has two stipulations pertaining to fleet size; the pertinent one from a compliance standpoint concerns the 35-unit threshold that dictates whether rental companies must comply with the law. How and when fleet size is measured may play a role in the event of a compliance check or an accident involving a recalled vehicle. Do I take extraordinary measures to ground? There may be some confusion as to whether a rental company has an obligation to ground a rental vehicle already on rent, either 24 or 48 hours (depending on fleet size) after receipt of the recall notice. The language in the law provides that a “covered rental vehicle in the company’s possession at the time of notification” is precluded from being sold, leased, or rented until the defect is remedied. Vehicles in the hands of renters are not in the rental company’s possession; therefore, those vehicles are precluded from the 24- or 48-hour grounding provision. No such obligation is imposed on car rental companies to ground recalled vehicles being driven by renters. How do I manage all these notices? The task of processing recall notices and checking them against rental fleet inventories presents an ongoing challenge. At this point, notices are only sent through the United States Postal Service. 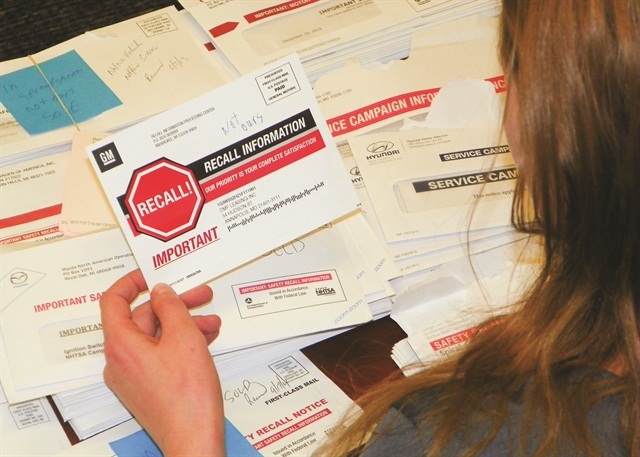 Though some manufacturers collate VINs of recalled vehicles into one mailing, most mail one notice per VIN affected — an operator with 50 recalled units would find 50 letters in the mail. “The biggest problem we have is the number of incorrect notices,” says Mike DeLorenzo, executive vice president of International Franchise Systems, which owns the NextCar, Priceless, and Rent-A-Wreck brands. DeLorenzo estimates that 80% of the notices his company receives are erroneous. Conversely, operators may acquire vehicles that are not registered but are under recall; therefore, the operator would not receive the recall notice. If vehicles are sold outside the country, “I’ll get those recalled notices forever,” DeLorenzo says. Two more factors exacerbate this process. The first is the number of errors in the NHTSA database to begin with. What happens when no parts are available? The greatest compliance issue for all car rental companies is dealing with the situation in which the recalled vehicles do not yet have a remedy or parts available for that remedy. Rental operators have no control over parts availability, which makes honing processes under your control all the more important. Rather than waiting for the mailed notice, a proactive approach to identification allows operators to start grounding and repairing them as soon as the recall is issued, DeLorenzo says. The first step is to utilize the NHTSA recall database (www.safercar.gov, “Recalls Spotlight” tab). While the system today requires manual input of VIN numbers to determine if a vehicle has an open safety recall, it can be used strategically. Brad Kjar, director of operations for U-Save Car & Truck Rental, recommends that operators and key staff subscribe to receive alerts of recall announcements as they are announced. The website also provides updates on parts if they aren’t available immediately. Make recall checks part of a routine process: DeLorenzo recently modified the company’s preventive maintenance process to include a VIN lookup to check for recalls. However, when the law is enacted, this might not be frequent enough. “At the pace these recalls are issued, if you’re not checking every VIN every day, you’ll miss some recalls,” says Macdonald. AutoAp’s Dynamic Recall Management service connects to a current fleet VIN data feed and verifies the status of safety recalls to the VIN level. A daily emailed report lists VINs with open safety recalls. By starting with a client’s actual fleet VINs, says Macdonald, AutoAp’s service overcomes the problem of recall notices being sent on vehicles no longer owned by the client. With the impending law, it is imperative for operators to define the company’s recall process in writing and clearly communicate it to staff in every location. Customer communication is equally as important, both in store and through your existing customer database and loyalty programs. The customer communication process is just as important if a vehicle is recalled while on rent and an agent is obligated to inform the renter and ground the vehicle by law. If the renter does not respond, proper documentation of the communication attempts should be taken into account in the event of an accident or a compliance check. The major car rental companies have the facilities and support to fix many recall issues themselves, and they are authorized to do so by the auto manufacturers. Smaller rental companies must rely on repairing vehicles at the franchised dealership of the manufacturer that issued the recall. Don’t view the work as an imposition on the dealership — recall warranty claims are not only charged back to the OEM, the industry average recall repair is $250 with a 55% margin, says Macdonald. One way to mitigate exposure to recalls is to diversify fleet acquisitions across more manufacturers. In the real world, however, recall considerations do not supersede larger considerations of rental rate potential and resale value. Diversifying may also mitigate your leverage to repair with a single manufacturer, Kjar says. When buying used, check for active safety recalls on the models you’ll buy before going to auction. Some issues arising today may not be resolved until NHTSA issues regulations interpreting the law. Many answers will come only as processes are refined in the real world. Though the law has yet to take effect, dealing with recalls has been a fact of life in rental fleets for years. As such, car rental operators are continually honing their processes. The tips and best practices offered here will become even more refined moving forward. The Raechel and Jacqueline Houck Safe Rental Car Act of 2015 (“Safe Rental Car Act”) was part of the larger Fixing America’s Surface Transportation Act, which passed both the U.S. House of Representatives and U.S. Senate in early December and was signed by President Obama on Dec. 4, 2015. Part of a motor vehicle fleet of 35 or more motor vehicles that are used for rental purposes by a rental company. A “rental company” is any individual or company that is engaged in the business of renting covered rental vehicles, and that uses for rental purposes a motor vehicle fleet of 35 or more covered rental vehicles, on average, during the calendar year. After receiving notice (electronic or first-class mail) of a NHTSA-approved safety-related recall, a rental company may not rent, sell, or lease vehicles in its possession at the time of notice, until the defect has been remedied. For companies with fewer than 5,000 vehicles in the fleet affected, they must comply within 24 hours. For companies with more than 5,000 vehicles in the fleet affected, they must comply within 48 hours. This 24-hour/48-hour rule doesn't apply to vehicles on rent at the time the notice is received. Rental companies may not deliberately make safety devices and design elements installed on or in a vehicle inoperative, unless the rental company reasonably believes that the vehicle or equipment will not be used when the device or design element is inoperative. Do Not Rent Exception. If a safety-related recall notice indicates that a manufacturer has developed an “interim remedy” or temporary fix to the defect (but not a permanent remedy), the rental company may continue to rent (but not sell or lease) the vehicles. As soon as a permanent remedy is available, the “do not rent” requirements will apply. Do Not Sell Exception. The restrictions on the sale of unrepaired vehicles do not apply to vehicles that are: (a) retitled as “junk automobiles” under state law; and (b) reported to the National Motor Vehicle Title Information System. The U.S. Department of Transportation (DOT) may inspect a rental company’s site and request records to determine whether the company has complied with the Safe Rental Car Act. Non-compliant rental companies could be subject to civil penalties of up to $5,000 per violation (maximum $35 million for a series of violations). These penalties will increase when NHTSA publishes a final rule interpreting factors to consider in assessing penalties. The DOT is authorized to conduct a study of the effectiveness of the Safe Rental Car Act, as well as other rental company activities that are related to the use and sale of vehicles with safety-related recall notices. The DOT must submit a Safety Recall Remedy Report by Dec. 4, 2016, with a summary of its findings and recommendations.